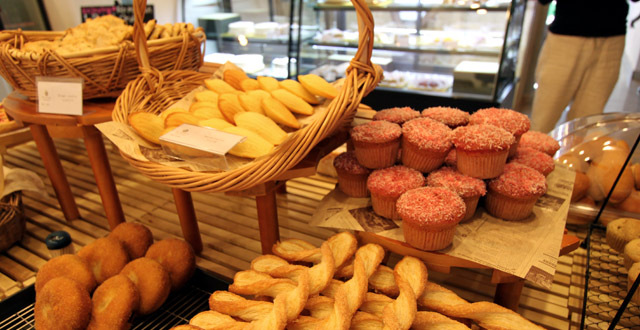 There’s a new cafe slash bakery in town and these guys aren’t messing around. The Koreans have thrown their hat into the Kigali cafe world and they’ve done it in a big, professional, welcoming, smiley-faced way. Rz Manna has been set up by nine Korean partners with the support of KOICA and Handgong Global University in Korea. They’re pushing the social responsibility model of business where part of their profits gets pumped back into the community in the form of funding do-gooding initiatives in Rwanda, mostly focusing on sanitation projects. You can get all of the journalistic-type info here: http://www.newtimes.co.rw/news/index.php?i=15454&a=69636. The name is pronounced ‘Roz Manna’ which, I’m told, means something that I forget in Hebrew. Then I was told that it’s something from the bible. 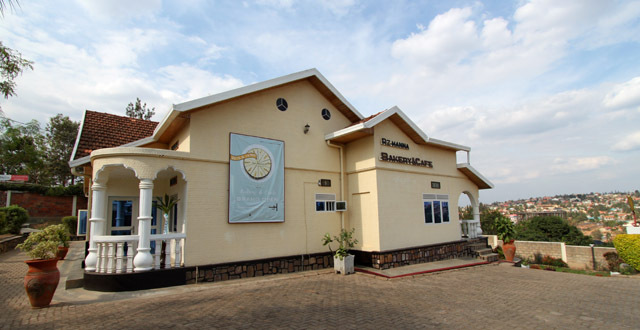 Is this is yet another Jesus-affiliated Kigali bakery? I’m not sure. I prefer my cake without a side of God but with the deliciousness they’ve got on offer, I’m willing to happily play along and I think I have a new favourite Kigali cafe. Too bad it’s all the way over on the other side of town but it really is worth making the trek. The first time I was there they, and the rest of the area, were having water problems and there was no coffee on offer. I opted for a strawberry and banana smoothie and a piece of mocha cake. 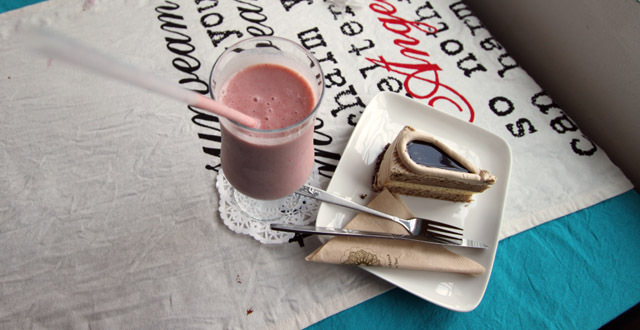 The smoothie was think and flavourful and the cake was good as well. Neither were things I’d go out there specifically for, but my first sampling of food at Rz Manna was a positive one. It’s the service there that made me want to come back for more. The place is packed with staff, everyone smiling. There was even someone opening the front door to new arrivals. The counter staff taking the money were efficient and knowledgeable and the kitchen (that can be seen from the ordering counter) seemed to be working well. The problem is that almost everyone working there on my first visit was Korean. On my second visit the staff had been swapped over and the place was being run completely by Rwandans. Not a Korean in sight but the service was just as good as the first time I visited – door opener, smiling faces everywhere, quick service at the counter, fast delivery of delicious things without any surprises. Very impressive when compared to my experiences at almost every other restaurant or cafe in the city. I don’t know what kind of magic tricks the Koreans have up their sleeves (Fair wages? Decent training? Strong, supportive management? …madness!) but Rz Manna are doing something right and the fantastic service is a reflection of that. Even when the service isn’t so good, it’s hard to get too cranky. The second time I visited I ordered a coffee with some cold milk on the side. The little cup the milk came in was impossible to pour without spilling everywhere and the coffee mug was way too full to fit any milk anyway. The server spilled the milk everywhere and then told me the coffee was very, very hot as he hovered it over my legs, serving it with shaky hands. It was slightly terrifying for my legs. Then he offered me a straw. But the entire episode was done with such a huge smile that I couldn’t help but feel like the whole thing was more cute than anything. The ‘the service isn’t great, but at least they’re trying’ thing doesn’t usually work with me in most places but add a huge smile into the mix and it’s hard to find things to seriously complain about. Yep. It’s that easy to win me over. 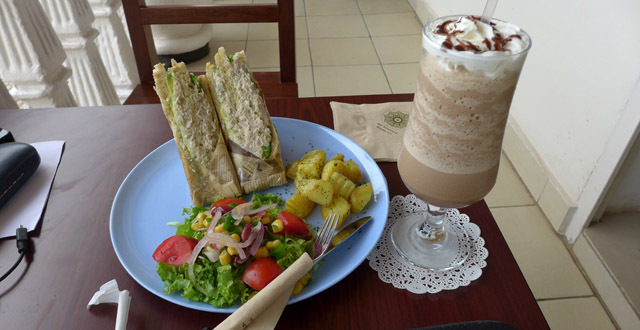 On my second visit I also discovered Kigali’s best tuna sandwich (Rwf 3,500 including sides). It’s a triple decker on lightly toasted bread (which adds a certain ‘something’ to the overall taste) completely crammed with delicious tuna. It’s pretty mayonnaisey which I like but might not be to everyone’s taste. Add some avocado, lettuce and pickles (the reason I think it’s so damned tasty) and you’ve got a very fine sandwich, indeed. The salad and potatoes were an ok addition but I found that it make the meal a bit too large for me for lunch. I’d prefer the option for a cheaper price and just the sandwich but, for the moment, it’s a package deal. You can also get a pre-packed lunch box for a quick takeaway. Ah Rz Manna… is there anything you can’t do? Overall the prices here are about on par with Bourbon but I think the quality justifies the price in most cases. Bourbon’s cakes are dry and horrible, Rz Manna’s are not. One example of the high cost is their strawberry tarts that are half the size but twice the price of the Umubano bakery’s. So go in expecting high prices but good quality and you won’t be too shocked. They’ll have to keep the quality up though as Umubano is an affordable alternative but they can’t come close to competing with Rz Manna’s selection. My latest visit also gave me a look at all of the new bakery items on offer, most notably the doughnuts. There was a stack of them on display and they looked and smelled great. Next time I will eat you, doughtnut. The signboard with times for the next round of fresh breads is a nice touch, as are the free samples to try out new things. I had a little sampling of one of their ciabatta which was great but I haven’t taken home any of their breads and goodies yet, so I’m not sure how they are. 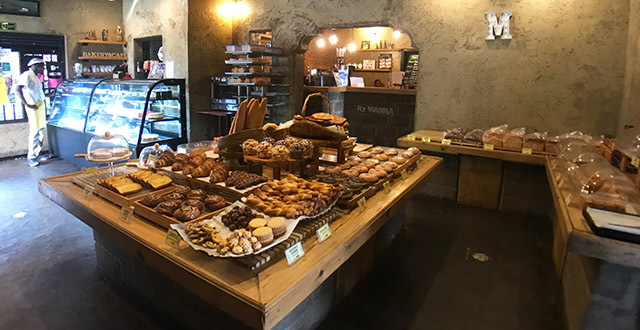 It’s actually more of a bakery and a drinks place than a lunch spot, so I’ll have to give the baked section a go next time around. Rz Manna is located in a large house-style building not far from RDB on the road to the MTN Centre in Nyarutarama. There’s a nice view but the balcony is small so you only get to take it in if you manage to scam one of the two tables outside. Inside it’s sort of a funny setup spread across several smallish rooms but it works nicely and it gives the place a cozy feel. The tables are freakishly low which makes hunching over a laptop for even a short amount of time kind of uncomfortable. So if you’re hoping to stick around awhile to take advantage of their free wifi (which was fast when it worked but with an unreliable connection both times I was there) expect a sore neck at the end. But maybe it’s just a genius ploy to keep the hoards of laptop-toters away to which I say: Well played, Rz Manna, well played. I was particularly partial to the 60’s folk music playing quietly in the background. Sipping a strawberry and banana smoothy is just made that much nicer when you can sway along to ‘This Land is Your Land’. The second time I went they were playing some classical music softly. It’s all very soothing and lovely. Even the toilets are lovely… they have smiley faces on them. Smiley faces on toilets! It’s just a wonderful, wonderful place. Ok I’m going to stop gushing now. I really like this place and I’m thinking about their tuna sandwich as I type this. I’m trying to think of reasons I need to venture out to Nyarutarama. But really, Rz Manna is reason enough. Ok, I’m still gushing. I’ll shut up now and let you try it out for yourself. Rz Manna’s service is completely ‘off the hook’. Sometimes when you’re so used to bad service & inattentive waiters, excellent customer service comes as a shocker!! I absolutely loved their pastries though i thought they were over priced. Rz Manna knows what they’re doing. Great locale (unless you live way out in Nyamirambo, but why would anyone want to? ), great food and service I didn’t believe possible in Rwanda. As far as cafes in Kigali are concerned, this place takes the cake. I think ABC (or whatever it’s called now), Brioche and Umubano should be worried. I mean they serve ice cream on waffles. That’s just not playing fair. Bourbon? Well they’re not even in the race anymore. Sorry for your inconvenience. This is SHin from Rz MANNA. We do apology for the coffees. Thank you for your comment, and we will do our best to serve our customer. Rz Manna.. has such potential its such a shame about the really really awful service. I’ve been here about 8/9 times and have yet to manage actually obtaining a sandwich.. arriving at 12.30 i’m told its too early for sandwiches.. yet by 12.30 another day its too late? Ever heard of managing your supplies? I’ve really tried to give this place the benefit of the doubt but after about my 9th unsuccessful trip week days and weekends in search of a sandwich from the 12 midday to 2 pm time.. i give up!! At least Brioche can actually furnish you with something to eat.. So Rz Manna? what is the story.. Do you actually do sandwiches..?? Also be prepared to wait a very long time to pay if you do pick up a pastry..
No sandwiches!?! I’ve been twice specifically or the tuna sandwich and both times I guess I got lucky. I guess these things are in demand! Sorry for your inconvenience Mr. Jamie. This is Shin from Rz MANNA, For the freshness, we do manage supply of Sandwiches. Again, we do kind apology for your inconvenience. These days, demand for Sandwich is High we prepare more sandwiches. Thank you for your precious comment. It’s fantastic. They did run out sandwiches the day I went – I was the last to get one ordering at 130. To me, that’s not a bad thing – guarantees that the next day things will be fresh. Incredibly nice and competent staff. Reasonable prices, which is often hard to come by in kigali. I’m scared that Rz Manna will go the way of all restaurants and cafe’s in Rwanda. They start off well but then both food and services gradually deteriorate. Just little things like cold or reheated chips; serving the wrong coffee; making nearly all their breads with sugar – even garlic bread!!! BUT I love this cafe/bakery and go there often to chill out, but lately I have been noticing little ‘slips’ here and there and sometimes just not enough attention to detail. A shame really. My advice: You started off well, please, please continue to do well. Kigali, I, need you!!! The barista they had on duty today, Baptiste, was able to brew me a proper espresso. This has never happened before in Rwanda. The folks at Bourbon (and in any other place where they think they make coffee) can fill a small cup to the brim with a watery brown substance and call that a coffee. Not today. The barista at RZ came up with a proper espresso – just half of the cup, creamy and dense. Could have been made in Napoli. Well done, thank you. Oh Baptiste.. Thank you so much you make my families happy!